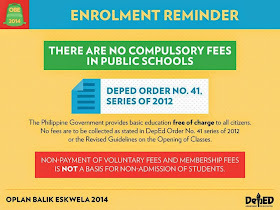 Manila, Philippines - The Department of Education (DepEd) reminded all school authorities that collection of any fees during enrollment and the first days of class is strictly prohibited. “We call on all teachers and school officials to see to it that we do not refuse a single student who wants to enrol. We strongly remind them that we do not collect any fees as a requirement for enrolment,” Education Secretary Br.Armin A. Luistro said. The education chief added that certain contributions in public schools while authorized by DepEd, do not mean that they are compulsory. “These contributions remain voluntary,” Luistro stressed. DepEd re-issued this call to teachers, school officials and parents to encourage the community to bring all school-aged children to school. 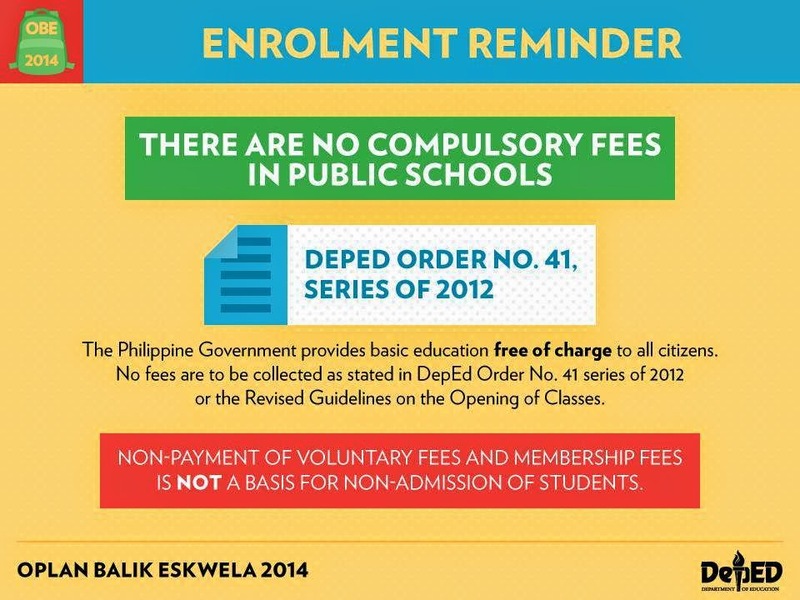 “Let me be clear on this: in no case shall non-payment of voluntary school contributions or membership fees be made the basis for non-admission, non-promotion or non-issuance of clearance to a student. And that includes withholding of school cards,“ Luistro emphasized. The fees which are authorized but not compulsory include Boy Scouts and Girl Scouts membership fees, Philippine National Red Cross, Anti-TB fund, school publication fee, and Parents Teachers Association fee. Based on DepEd Order 41 series of 2012, which remains in effect, Luistro has directed all school officials that no fees shall be collected from school children in kindergarten up to Grade 4 any time during the school year. For Grade 5 pupils up to fourth year high school students, there will be no collection from June to July. However, starting August this year until the end of the school year, the following fees may be collected on a voluntary basis: Boy Scouts and Girl Scouts membership fees of P50 per learner; Philippine National Red Cross, P35 per learner; Anti-TB fund drive of P5 per learner; school publication fee of P60 for every elementary pupil and P90 for every high school student. The Parents-Teachers Association fee must be reasonable and is to be determined during the PTA general assembly. The PTA can only collect contributions starting August and only after presenting to the PTA members and to the school head/principal report on the utilization of previous school year’s collections and the school year proposed budget with program of activities. “School fees should not intimidate parents into bringing their children to school that is why I urge all school officials to observe these guidelines strictly or face administrative sanctions,” Luistro said, adding that PTA fees, even though approved by a majority of PTA members, still remain voluntary. “Our public assistance station has received as total of 63 queries since Monday, some of them regarding compulsory contributions. In these cases, our team calls the schools and finds out the details. If the schools violate our strict prohibition on collection of fees, our legal department will send them a warning,” Mateo said. Mateo encouraged the parents to contact the DepEd public support station for any complaints, concerns, and questions at 636-1669, 633-1942, 0919-456-0027, and through action@deped.gov.ph.